In the wake of all the stunning reveals from Star Wars Battlefront II last weekend at EA Play, we now have yet another casting confirmation for the highly anticipated game. 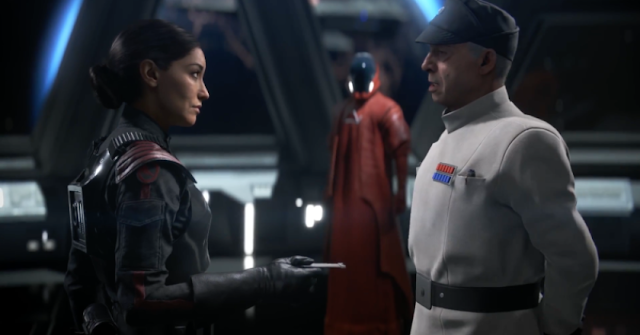 Near the end of the newly revealed gameplay trailer, we get a few new glimpses the game's main protagonist, and leader of Inferno Squad, Iden Versio, played by Janina Gavankar. Iden has a rich backstory within Star Wars canon, one which includes her father, Admiral Garrick Versio(above, right). Skordi is a seasoned actor who has appeared in several television series, including The Blast List, The Last Ship, and others. He has also worked on a number of video games before, including the Call of Duty Franchise, Mass Effect, and Skyrim. It exciting to have him finally join the Star Wars universe as Admiral Garrick Versio!